Four newly restored veterans standards were unveiled at a special ceremony in the council chamber this afternoon. A huge amount of time has been spent preserving the standards of the 8th Army Vets, the Korean Vets, the Burma Star Vets and the Normandy Vets. The restoration works comes off the back of a successful crowdfunding campaign launched by Wrexham Council in February 2016. It was the first of its kind for Wrexham Council, with Armed Forces Champion, Cllr David Griffiths explaining today that it had worked better than they had anticipated. 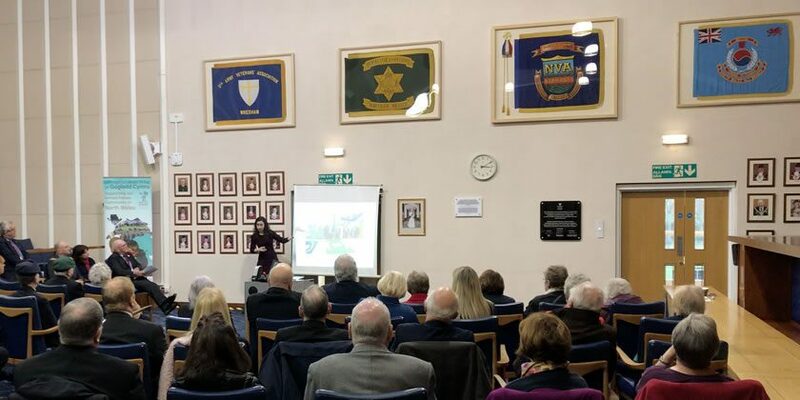 The project saw £11,889 raised to safeguard four veteran standards, with 17 per cent of the money raised directly pledged online via the campaign’s page on the Spacehive platform. The remaining £10,259 was donated off-line, either directly or at a fundraising event, for example, a cake sale, bucket collection, supermarket bag pack. The conservation works were carried out by the People’s History Museum in Manchester, who operate a professionally trained and accredited conservation studio specialising in textiles – particularly large flat textiles such as banners and flags which made them the perfect choice to work on the standards. Conservator Kloe Rumsey explained the hugely intricate work carried out, included cleaning, removing creases, creating a backboard and then a lot of hours stitching the standards to the board. They were then taken to Liverpool where they were professionally framed by Conservation Gilding. The Standards will be on permanent display in the Council Chambers and be available to anyone who would like to come in and see the restored Standards. If you are in town and want to pop in the Council say you’re welcome to do so, but as the Chamber is very much a working room, it would save you disappointment if you ring 01978 292000 beforehand and check to see whether or not the room is free.